Merino weaners need to reach bodyweight targets to ensure highest survival rates. All ewe weaners need to reach growth targets after weaning to achieve satisfactory reproduction performance as maiden ewes. Meat breed weaners require access to quality feed to achieve growth targets and meet market specifications. Excessive post weaning mortality rates are most common in Merino breeding flocks where death rates can be 10% or more. Such high losses are a major financial concern and significantly affect enterprise productivity and profitability. Wean Merino lambs at 14 weeks after the start of lambing. Wean lambs onto high-quality, low worm pasture to ensure continued growth rate and post-weaning growth and survival. Better manage feeding programs by weighing or assessing a random sample of weaners every 4–6 weeks over summer–autumn. Small increases in weaning weight make a profound difference to weaner survival. For example, a 14 kg weaner has a 34% lower mortality risk than a 12 kg weaner, whereas a 20 kg weaner has a 22% lower mortality risk than an 18 kg weaner. Small increases in the monthly growth rates for weaners can dramatically reduce mortality rates, eg, an increase of 0.25-0.5kg/month can reduce the mortality risk by 74%. Faster growing and heavier weaners accumulate more body reserves that they can use if required. The close association between growth rate, bodyweight and mortality risk means that supplementary feeding may be a cost-effective option in weaners. Apart from nutrition, special attention to weaner health is required such as drenching and flystrike prevention. Refer to Healthy and Contented Sheep. Ewe weaners must have sufficient growth rates to reach the liveweight targets set in procedure 10.1 to ensure adequate conception at first joining, regardless of the age. Give priority to meat breed lambs for access to high-quality pasture after weaning (see procedure 8.3 in Turn Pasture into Product) so that market specifications can be met (see procedure 3.1 in Market Focused Lamb and Sheepmeat Production). Early selection of paddocks is a critical component of managing lambs immediately after weaning. High feed quality: mixed perennial pastures: short green feed (1,200–1,500 kg green DM/ha), preferably with improved pasture species and 20% legume. Annual clover based pastures: 2000-2500kg DM/ha FOO. In the cereal zone a special purpose fodder crop or good quality stubble is an option. Low grass seed infestation: particularly barley grass or corkscrew. If lambs need to graze risky paddocks either spray top or slash grass seed heads to reduce the hazard (see Winning Against Seeds in signposts section). Low worm risk: specially prepared paddocks with low worm burdens (see procedure 11.2 in Healthy and Contented Sheep). Good quality stock water: easy access to clean drinking water and multiple watering points in larger paddocks. In Merino flocks, wean all lambs at 14 weeks after the start of the lambing. At three months, milk provides only 10% of total food requirements and weaning onto high-quality pasture, with a low risk of worms will ensure continued growth and low post weaning mortality. Heavier liveweight that can be more easily maintained until first joining. Higher conception rates for ewes at next joining. More lambs weaned from the following year’s lambing. Weaned lambs grow more wool. Breeding ewes grow more wool. These benefits are greatest in poor and variable seasonal conditions. Weaning meat lambs at around 14 weeks onto high-quality, low worm pastures can be beneficial, when targeting heavier weight markets. When high-quality weaner pasture is limited, wean lambs onto the best available pasture to ensure they grow. Ewes also benefit from better management to increase liveweight after lambs are weaned. This takes advantage of pastures in late spring before quality deteriorates with summer senescence. Aim to have weaners reach 50% of their mature liveweight as soon as possible after weaning. To achieve this target, weigh or assess a representative sample of lambs at weaning and, when practical, draft weaners into groups for preferential management. Weaners weighing less than 22kg (or 45% of mature weight) need to be managed to ensure weight gain of at least 1kg per month. Post weaning mortality is highest in the initial three months with the lightest weight weaners being most at risk. Most losses are in low liveweight weaners and management to increase weight gain will eliminate up to a third of deaths. Formulate supplementary feed rations to account for pasture quality and availability (see procedure 11.1 in Healthy and Contented Sheep). When lambing in the winter/spring, monitor or assess weaner liveweights every 4‑6 weeks over summer and into autumn until pasture quality and quantity is such that the growth rate meets targets. Where necessary, redraft weaners into appropriate weight groups and provide the best available pasture to the low weight group. Ewe lambs need to follow minimum liveweight targets set for maiden ewes from birth to pre-mating in tool 10.5. The target weight at any given time depends on the mature size of the ewe. As a guide, manage ewe hoggets to reach 75-80% of their mature weight by 15 to 17 months of age. Sheep CRC Lamb Growth Predictor Tool – calculate individual growth rates of lambs and predict finishing times. 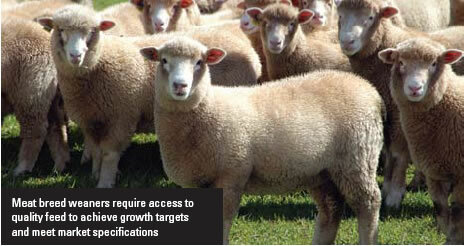 Visit: http://www.sheepcrc.org.au/ and search for lamb growth predictor. 45x7 - Joining ewe lambs for more profit. Stock reference LP1790. Download here.